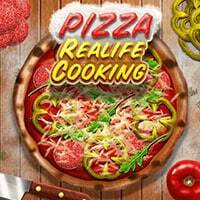 Become a chef and make a delicious pizza in this awesome cooking game Pizza Realife Cooking! Prepare all the ingredients on your chopping board and place your favorite toppings on the dough. Bake your creation until it’s crunchy and add basil leaves, Parmesan cheese or some rocket salad for a great taste experience! Are you hungry yet? Pizza cooking is a fun way to express your culinary creativity! Pizza can have a lot of ingredients so every person has its favorite. You can create your favorite right now in our cooking game! Pizza Realife Cooking Game is one of our Girls Games at Round Games. It is also tagged as a cooking game. To play even more free games, view our most played and all games pages. If you want to play more games like Pizza Realife Cooking Game: Then you can simply check out the games inside the game tags that are the most relevant to your interests or check the Girls Games category or check the related games section at the end of the game page.